We track down every shipment, which goes from Ethiopia via air, sea or road and bring shipment information including Bill of Lading details into the EthiopianImporter.com. Our dedicated database team verifies all shipping records that are received from our trusted sources before delivering you the most accurate trade facts and figures of Ethiopia. We help you to see a wider trade picture of the country’s total exports with the help of our analytical business reports that are generated by our financial experts and data scientists. We cover all major data fields in our export data of Ethiopia that include HS Classification, Product Description, Exporter’s Details, Value of Shipment, Origin & Destination of Shipment and so on. Our database is updated monthly through which we are able to satisfy your data requirements. You can see samples of Ethiopia exports on our website and take your decision to get complete data from us accordingly. We provide a simple process of buying our export data of Ethiopia. You just have to fill up an enquiry form and our sales representatives will contact you for the same. Our well-structured destination provides you an option to access our sample of Ethiopia export data. It will help you in knowing which data fields we cover in our export report. As a result, you will be able to take the right business decision to have trade data of Ethiopia from us. So, have a look on these two samples and fill up an enquiry form to get complete shipment records of Ethiopia exports. As per export report of Ethiopia, the country exported coffee, tea and spices of chapter 09 the most in 2015. 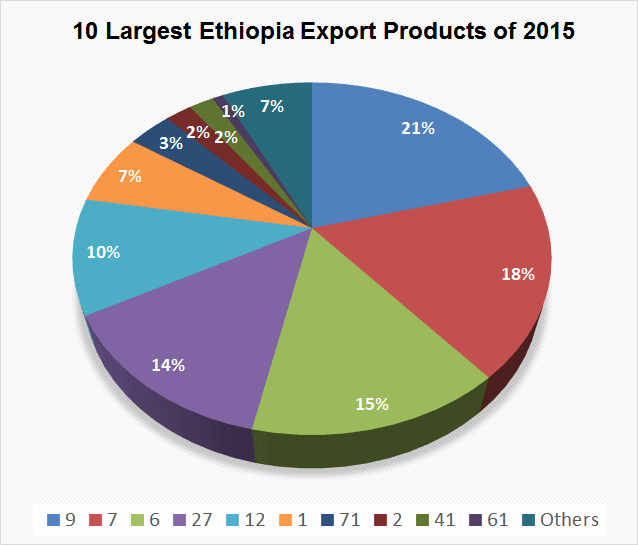 This chart and table shows the 10 largest Ethiopia export products of 2015. According to a report on Ethiopia exports, Somalia stood as the largest export partner of Ethiopia in 2015. 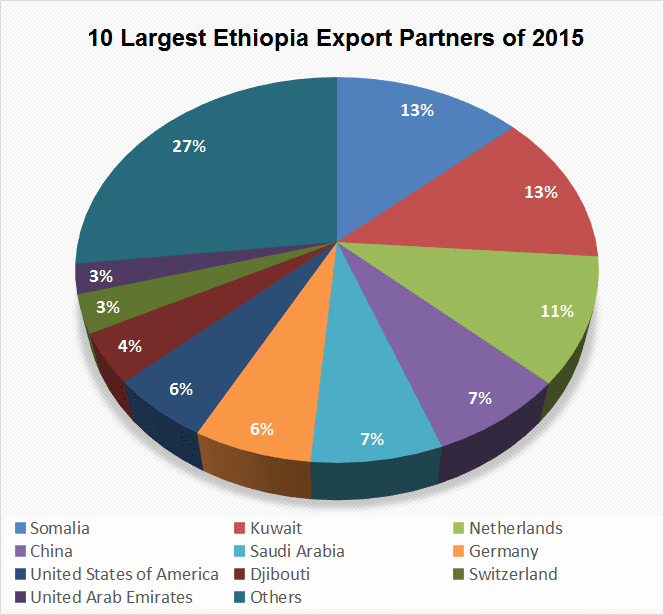 This chart and table shows the 10 largest Ethiopia export partners of 2015. As per Ethiopia export data of 2015, the country’s export value of total products fell marginally to USD 5027546000 from 2014’s USD 5666889000. To get a wider export picture of Ethiopia, have a look at the on chart and table below in which you will find export figures of total products of last 10 years along with month-wise export data of year 2015.